The trend of mascots on drum sets is continuing for another day. 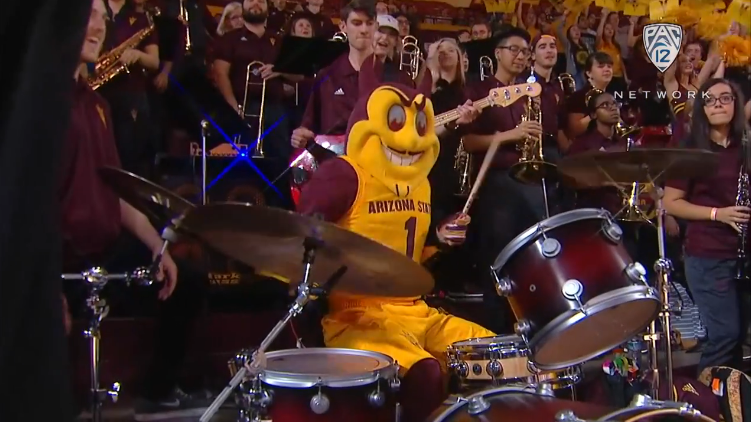 Here's a look at the Arizona State mascot, Sparky, absolutely killing it on the drum set with the pep band as part of their distraction method for free throw shooters at the school's basketball games. We have seen an amazing number of mascots recently whom are former band members. Traditionally we expect them to come from the gymnastics and cheerleading teams, but lately its been the bands!! We have been able to confirm that the mascot at Arizona State was in fact a member of the Sun Devil Marching Band drumline before becoming the mascot. HOW COOL IS THAT!? !